* Gadzooks! Look at all the colors! 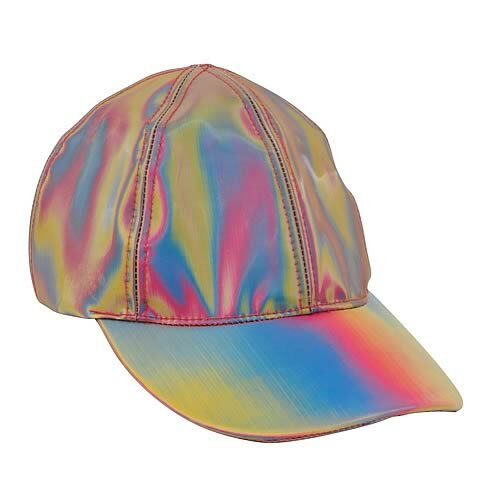 * Marty McFly’s color-changing cap, reproduced in every detail! * Wearable prop replica from the Back to the Future movie. * Features ultra-refractive fabrics and Velcro closures. According to the blockbuster Back to the Future movie series, the year 2015 brings many advancements– everything from hoverboards to self-drying jackets– and Marty McFly Jr.’s signature color-changing cap! Reproduced in every detail, this one-size-fits-all, wearable prop replica features ultra-refractive fabrics, adjustable velcro closure, and enough 21st-century tech to erase more than a photograph. Add this terrific temporal trapping to your ensemble now… before you run “outatime”! ah, the future was so holographic back in the 80’s. I wonder how long it’d take for the shine to dull on this future hat. 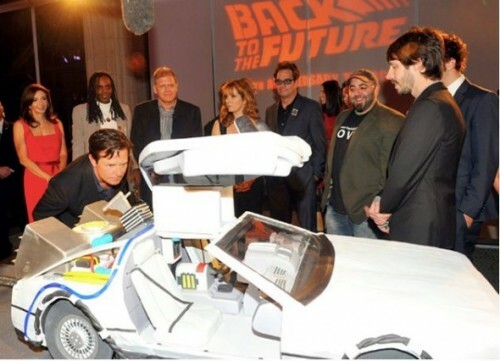 That’s an 8-foot long DeLorean cake baked for the cast of Back To The Future for their recent 25th anniversary celebration. Oh, and there’s video over at That’s Nerdalicious. Who knew that time travel could be so tasty? The Hoverboard is a project made by Nils guadagnin, a young french artist. It is a copy of the hoverboard from the movie Back to the Future II. Integrated into the board and the plinth is an electromagnetic system which levitates the board. A laser system stabilises the object in the air. * An Entertainment Earth Exclusive! The toy you always wanted is finally here. * Electronic lights and sounds! * Gull-wing doors swing open! * Wheels pop out for “flight mode”! Based on the 1989 Back to the Future II, this is the best toy DeLorean money can buy. 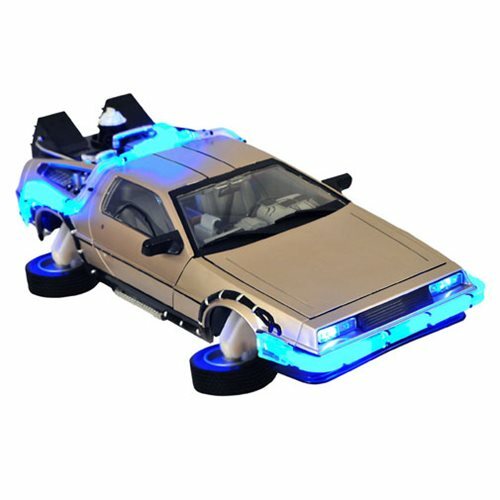 Not only does it feature classic DMC engineering (like the gull-wing doors and Doc Brown’s own special modifications), but our version of the DeLorean automobile also has the 2015 hover conversion kit. That’s right, our exclusive vehicle has wheels that pop out for “flight mode”! The wheels spin, the doors open, and its plastic construction feels just like the toy you always wished you had. Don’t miss your chance at owning one of America’s finest motorcarsâ€¦ with a special, futuristic, time-traveling twist! Limited edition. 1:18 scale, 14-inches long. Compatible with 3 3/4-inch scale action figures, not included. Note: While this vehicle is scaled to interact with 3 3/4-inch scale action figures like Hasbro’s G.I. Joe and Star Wars lines, there are no figures for Doc or Marty planned for release at this time. I think my question is: does it require batteries or can I plug it in? I would much rather be able to plug it in, put it on a timer and forget about it, instead of having to worry about batteries corroding away the insides, yuck.